Basically, this is knitting diagonally. There are two main types. 1) Starting at a corner and increasing at each end. This will make a triangle. The inverse is to decrease at each end. 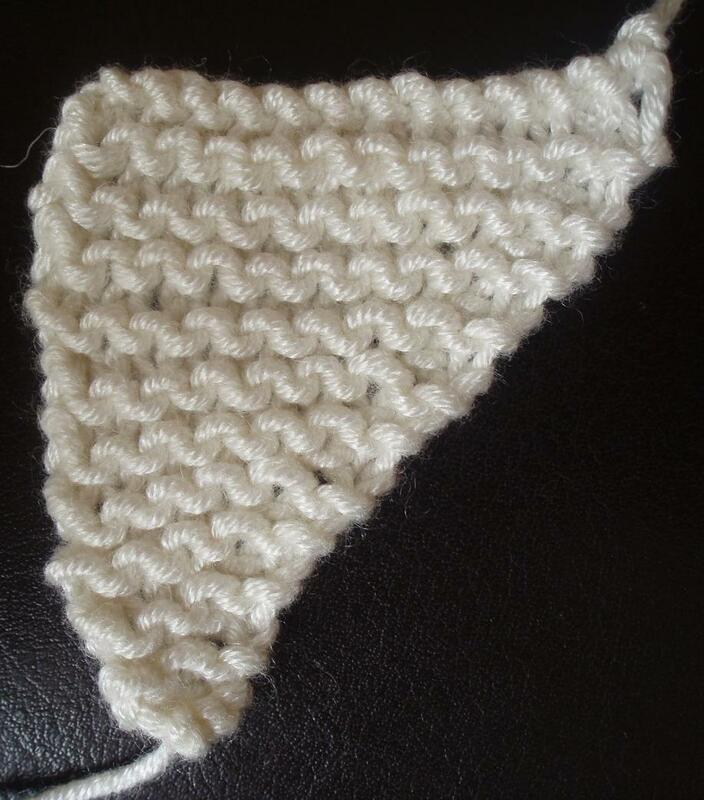 2) Starting straight and tilting the knitting by increasing at one end and decreasing at the other. This will make a parallelogram. Let’s take a look at increasing angles when starting in the corner. The following swatches have all been made by casting on two stitches and proceeding in garter stitch. The swatches vary in the number of stitches per row that are increased. 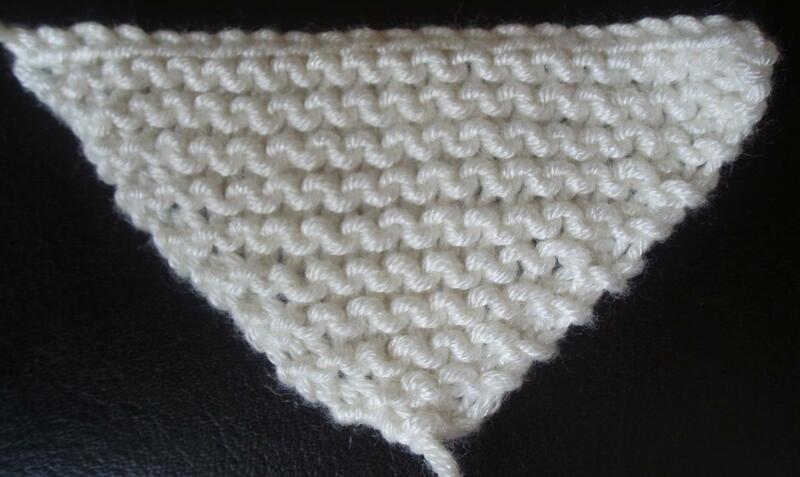 The increases were made by knitting into the front and back of the stitch. Swatch A: Increase in the first and last stitch on every row. This gives an increase rate of 2 per row. See how quickly the swatch widens. This swatch widens rapidly to make a 130° angle (approx, I’m using my kid’s school protractor to measure it). 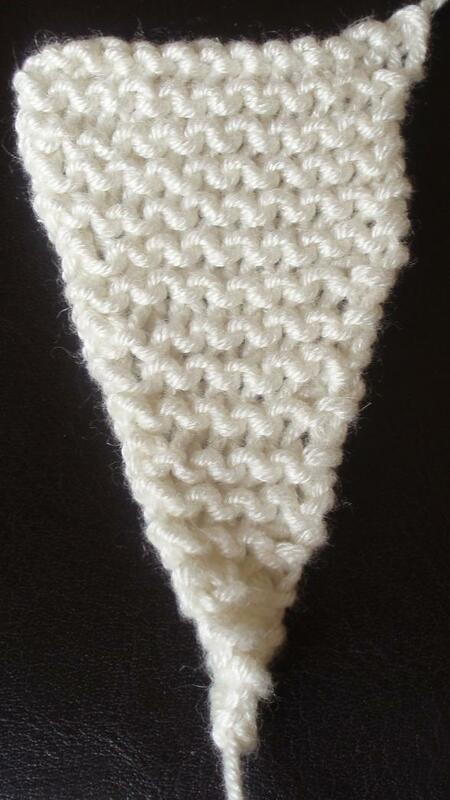 It would be great for a shawl or scarf. Swatch B: Increase in the first stitch in every row. This is an increase rate of 1 per row. This creates a very nearly 90° angle. Good for panels and squares. Swatch C: Increase in the first stitch on every 3rd row, or .33 per row. This widens slowly. It might be a good rate for triangular inserts in a swirly skirt. Approx 30°. This is probably too narrow for bunting flags. I’d estimate an increase rate of .5 would be better for bunting. Swatches knitted up in Sirdar Flirt on 3.75mm needles.